It's time for some spring grilling! Here's an easy (and delish) weeknight meal the whole family will love. Oh, and it works real well on a Friday or Saturday, too. Friday pizza nights nearly always mean Saturday leftovers, which can almost be as much of a treat as the night before. While I've eaten my fair share of cold cheese slices, some more complex recipes deserve to be brought back to life in the way they were intended. It's that time of year when our special dinner nights are in that "in between" phase. Gone are the chili nights, the slow-cooked soups, and the long braises of winter, but it's not quite time for all day cookouts, the throwing together a plate of summer produce and bread and just embracing the simplicity of the season. To which we say: good. Use this transitional time to nail down something technique-based, like perfecting homemade pizza. This is an interactive graph based on some serious math that proves: it's always a better financial decision to get the bigger pizza. Always. A rocket grill, you say? I'm intrigued. Turns out, a rocket grill is "super mega" way of describing an crazy efficient charcoal grill, which uses a tiny amount of fuel to create searingly high temperatures that mimic commercial wood burning fires, upwards of 800°F, perfect for pizza, steaks, and shellfish. It's one of life's inevitable questions. Unless you're sharing the pie with someone you also share both the bank account that paid for it and the exact same appetite, eventually it's going to come up: Who gets the last slice? Jim Lahey, the creative baker behind the excellent no-knead bread recipe and the even more excellent no-knead pizza dough, shares his tips for making outstanding pizza at home using ManMade's favorite method - the grill. A man who calls himself "Captain Auburn Beard" had a dream...a dream to one day have facial hair in the shape of the Batman logo. I'm sure that most of us, given the ideal opportunity (hassle-free admission, a full scholarship, and a magical year away from other jobs and responsibilities) would happily attend culinary school, and learn the knife skills, cooking techniques, and classical traditions developed over the centuries to turn good ingredients into great meals. There's a very good reason the pizza from your local, independent place tastes better than what most of us can turn out at home: the crust. Even with the perfect sauce, the best dough, and an amazing mix of toppings, lots of homemade pizzas come out too thick, too soft, and too soggy. 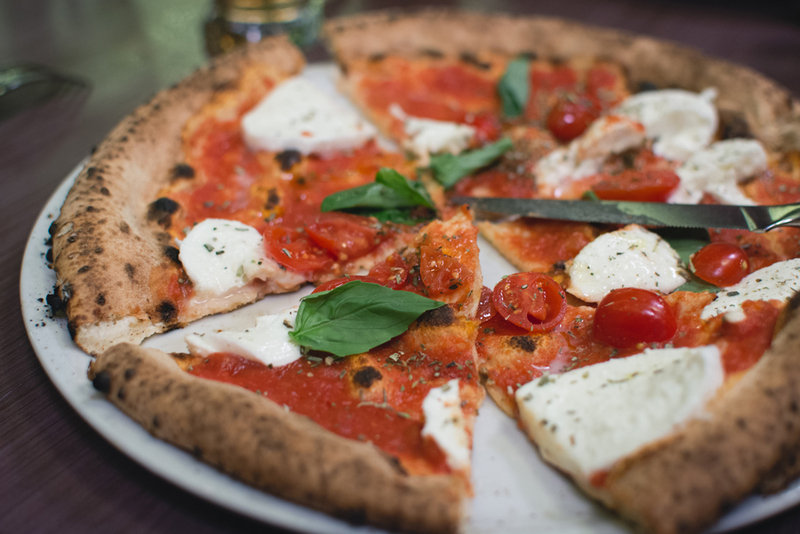 See, commercial pizza ovens can reach temperatures in excess of 1000°F, providing that crisp, cracker-like crust that makes pizza so special in the first place. The Kettle Pizza extension is a stainless-steel sleeve designed to fit over a standard 22 1/2" Weber-style charcoal grill, turning it into a charcoal or wood-burning pizza oven. I'm not sure if this is a good value, or not. So, let's discuss. Pizza Beer: Slices and Suds, Together at Last! When it comes to strange foods and drinks, I'm easily intrigued (have you tried our peanut butter cheeseburger yet?!). But here's one that might be a little too bizarre for me: Pizza Beer. Granted, beer and pizza are both wonderful creations that I enjoy on a regular basis, but a beer that tastess like pizza...? Ok. Where do I begin? Pizza Boomerang, a video created by Barcelona-based Sofa Experience Communications, is without doubt the strangest video I've ever seen. After I watched it for the first time, I was confused...I couldn't decide if I was elated by how amazing it was or deeply disturbed by how, well, disturbing it was. There's really not much else I can say about this. Words can't quite describe what it's like to watch PIzza Boomerang, so I'll leave it at that. One thing I should mention, however, is that it's NSFW...or at least one particular scene is. So if you're feeling adventurous, and the kiddies aren't watching (seriously, I wouldn't want to have to explain the plot to a child), then sit back and enjoy the show. Some things seem so wrong that you just need to try them, and I think SpaghettiOs Pizza is one of those things. That's right…SpaghettiOs. So fire up the oven, break out the can opener, and get cookin'. The Monster Workshop's Stitches and Glue makes these amazing, slightly terrifying, and surprisingly adorable "monster skin rugs". But, you can't just decide you wanna have pizza tonight, and have a steaming, cheesy pie in front of you in an hour. You gotta make the dough, let it rise, knead it like crazy, let it rest, preheat the oven or grill to crazy hot temperatures, etc, making it an all-day, or even a two-day, affair. Most parents try their best, but end up being selective about junk food. Some won't let their kids drink soda, but give them fructose-sweetened punches at every meal. Some say no to candy, but doughnuts and packaged desserts fill the pantry. When I was a kid, we weren't allowed pizza rolls. We had Bagel Bites, and I learned to use the oven with Tony's frozen pizzas, but I never had a Totino's Pizza Roll until I was in college, and some nostalgic friend bought a box on a whim.